Is Your Company Using Pinterest Yet? Have you checked out Pinterest yet? If not, you should. Pinterest is one of the hottest social media sites on the web today and has experienced exponential growth over the last 2 years. What is Pinterest? Pinterest is a place for people to save, organize and share images on the Web. Here is the official definition of Pinterest directly from Pinterest, “we let you organize and share all the beautiful things you find on the web.” Most users use Pinterest to keep up with the latest fashions, plan their weddings, decorate their homes, and organize their favorite recipes. In June 2011, Pinterest had 608,000 monthly U.S. unique visitors. One year later? 20,470,000. In regard to mobile devices, 55% of pinners use iPads, followed by Android (28%) and iPhone (17%). We even have a couple of “fun” categories such as Career Humor, Songs about Jobs and Apple recipes. 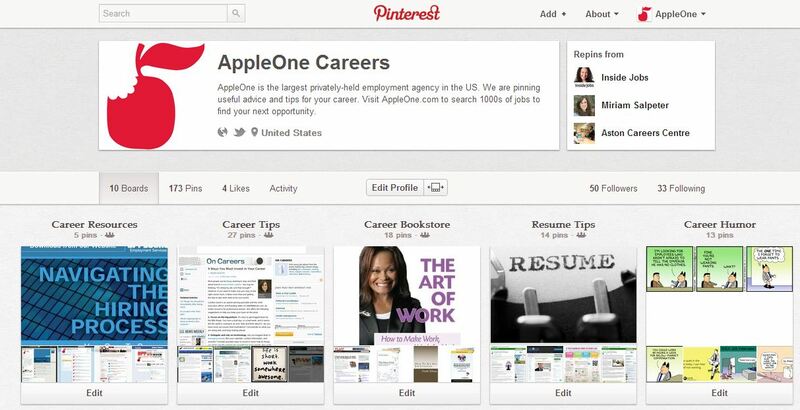 Check out the AppleOne Pinterest account. Getting Started – If you have not visited Pinterest yet, the best starting place would be to lurk and explore the site first. You can search for specific content or just start clicking on images to see where you end up. Otherwise, getting started with Pinterest is pretty simple. You sign up for an account, complete your profile and can then start pinning. You put your pins onto boards and you can create new boards on the fly. Pinterest has a Pin It bookmark applet that makes it easy to pin any web page. I highly recommend getting the Pin Page applet from Snapito. Since most of the content in the recruiting and careers industry is not visual, the Pin Page applet takes a snapshot of the page or article I want to share, and that becomes the visual to share. What Else Is Cool About Pinterest? – You can pin YouTube videos and Slideshare presentations into Pinterest — and the cool part is that they will automatically embed themselves on your Pinterest board. What is the Pinterest payoff? – Obviously, shopping and e-commerce is fueling a lot of the Pinterest growth. The average order value for items ordered after seeing a picture on Pinterest is 2 to 3 times what a similar post on Twitter or Facebook can draw. For other businesses on Pinterest, it is mostly about experimenting with the platform and planting a flag as another source for raising brand and company awareness. My recommendation to all companies is to experiment, start small and see where it takes you! Learn more about Pinterest – You can learn more about Pinterest and their CEO Ben Silbermann from Fast Company’s October 2012 issue.